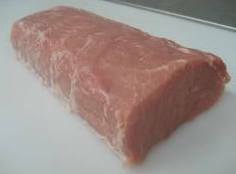 Boneless Pork Loin Roast, Is A Meaty Tender Lean Cut. The top 2 photos are of a single boneless loin roast. The bottom 2 photos are two single roast, one stacked on top of the other and tied together making1 large boneless loin roast. The pork loin roast is the center portion that lies between the rib and sirloin on the pork loin. The center loin roast is a meaty, tender lean cut, with somewhat less fat than the rib end of the loin. This popular cut adapts well to brine, marinades, rubs and glazes and for maximum tenderness should not be cooked more than medium doneness. Most roast pork recipes call for cooking temperatures of 325-350 degrees and some even higher when cooking a pork loin roast. What happens in our experience cooking a pork loin roast at a higher temperature will cause a roast to dry out on the outer parts and shrink more depending on the size of the roast by the time its done cooking. 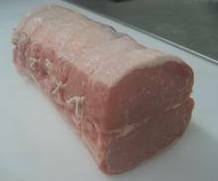 A boneless pork loin roast can be purchased as a single roast or a double. A double is simply 2 singles stacked one on top of the other, tied with butchers twine at even intervals giving the roast an even round shape. A double roast is great for a larger crowd but if you purchase a single loin roast we recommend tying it with butchers twine at even intervals to give the roast a more even shape which will help cook the roast more evenly. 4. Transfer roast to roasting pan on a rack set inside the pan. Cook until the internal temperature reaches 145-150 degrees using an instant read thermometer inserted into the center of the roast. Approximately 25-30 minutes per pound should register about 145-150 degrees. 5. Remove roast from the oven, transfer to a cutting board and tent loosely with foil 15-20 minutes. The internal temperature will rise about 5-10 degrees while resting to a temperature of 155-160. For maximum tenderness do not cook past this temperature. 6. Cut the twine off the roast, slice thinly across the grain and serve. Try this Garlic Paste recipe with your boneless pork loin recipes. For this recipe skip steps 2 & 3, preheat oven to 300 degrees and begin on step #4 cooking approximately 25 minutes per pound. Below is a cooking chart for pork roast. Remember you should always use an instant-read thermometer to check the doneness of a roast. The internal temperature will rise about 5-10 degrees during resting time, remove the roast 5-10 degrees before desired doneness. It is not recommended recipes for pork loin be cooked less than medium doneness. 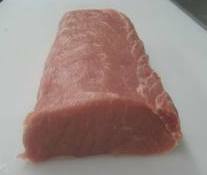 Share Your Boneless Pork Loin Recipe. Do you have a great boneless pork loin recipe? Share it! Enter The Title Of Your Pork Loin Recipe. Do you have a picture or graphic to add? Great! Click the button and find the picture on your computer. Select it and click on the button to choose it. Important Note: The maximum image size accepted is 800x600. To resize any photo larger than 800x600 pixels use your graphics software or a Web-based re-sizer, such as http://www.picnik.com/.